A lot of tributes have been written up about this chocolate banana cake hence out of curiousity, I tracked down this tiny cafe opened by Malaysian designer, Zang Toi just in front of the Malaysian Designers section in Sungai Wang Plaza. Although they serve local food, pastas and sandwiches and humongous looking banana milkshakes, I was determined to just try the Chocolate Banana Cake (RM8.50 with ice cream) which I have heard so much about. It's composed of four layers of chocolate cake interspered with freshly sliced bananas. 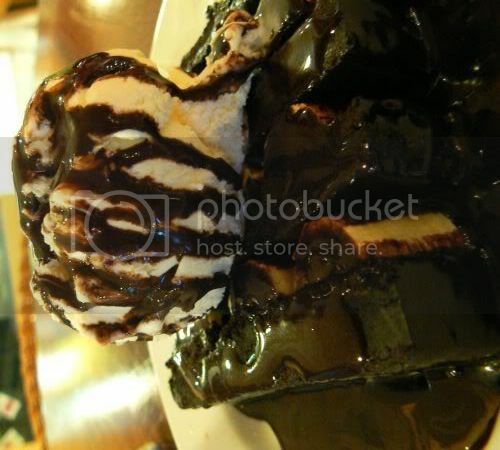 A scoop of vanilla ice cream completes the whole ensemble with lots of chocolate fudge sauce. 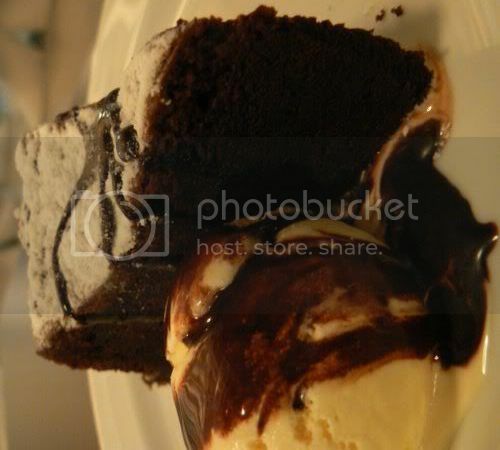 The cake layers are fudgy and moist making it pure indulgence or perfect to get over a broken heart. 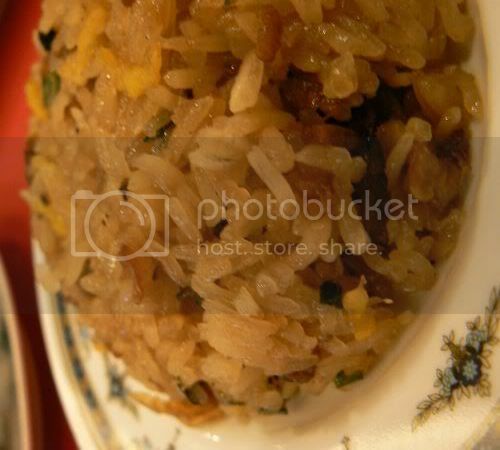 Dining out especially at Chinese restaurants are a great way to catch up with family and friends. Usually all it needs is a special occasion or a relative who visits from far away to start a string of lunches. This past week has been dining at Overseas Restaurant and Sam You in Petaling Jaya as my cousin's kid was back from Kenya. Since it was a whole table of hungry relatives, I didn't take pictures of lunch in Sam You but believe me, the food was excellent there. 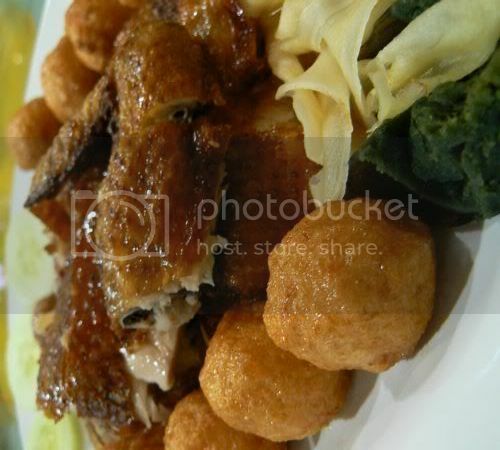 My mother was so happy with their Pat Poh Duck, a dish you don't really get nowadays in restaurants but was a popular dish in weddings during her time. You need to order that dish in advise as they need to braise the duck and stuff it with all the yummy items like chesnuts, lotus seeds, mushrooms and etc. 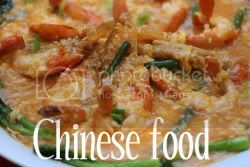 Other memorable dishes were their mayonnaise prawns which had a nice tangy taste or else it'll be too rich and an excellent glutinous rice. I'm not usually a carb person but I polished off my bowl of rice that day. Back to Overseas Restaurant which was a breeze to get there during the festive holidays. The best part about dining here is the restaurant also does valet parking for RM4. 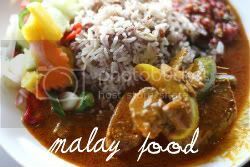 Although Overseas Restaurant is an established name with branches all over Kuala Lumpur and Ipoh, we still prefer the food quality at this outlet. After dining here for the umpteenth time, we usually order their signature dishes. 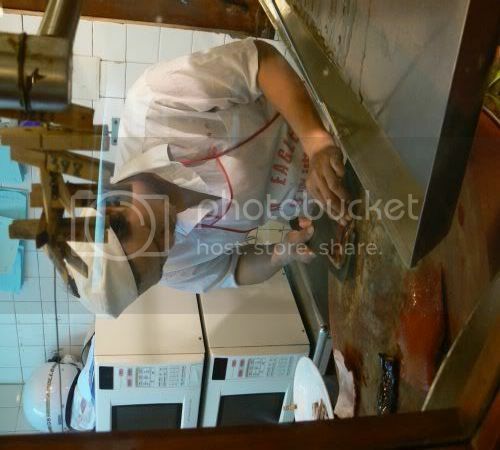 Their barbequed meats are famous here which a man will chop them up as and when orders are placed. They have a selection of suckling pig, ducks, ducklings and their famous char siu. It's the sticky and black version coupled with melt in the mouth meat and fats. Even my cousins from Hong Kong can't get enough of this char siu and when they're visiting in Kuala Lumpur, they must eat this every other day. 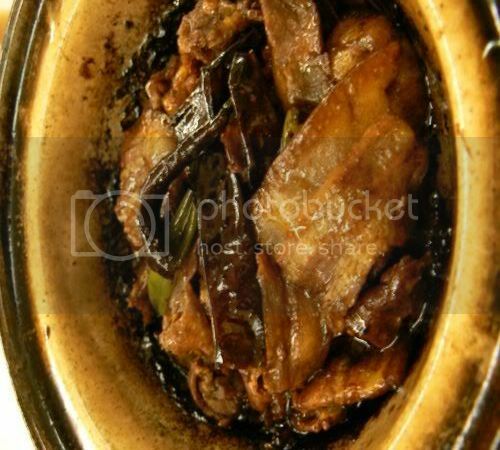 The other signature dish is the claypot sliced pork belly with salted fish. 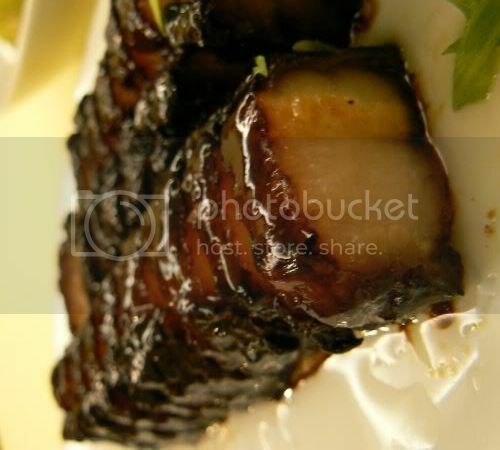 Thinly sliced pork belly is tossed in a black soy sauce with hints of sugar, salted fish and dried chillies. 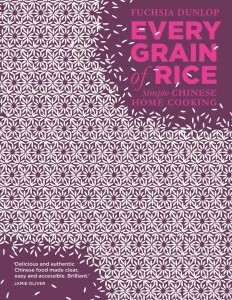 Eat this with lots of white rice as the sauce is addictive. I actually took these pictures quite some time ago but decided to dig them out after we ate here recently. Besides these dishes, we also had their Steamed Chicken with Soya Sauce, Butter Prawns and fried lotus roots with lily bulbs. 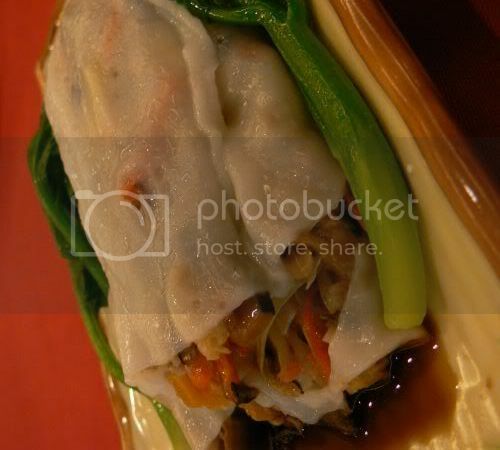 Although these dishes can be commonly found in other chinese restaurants, their versions always taste nicer. 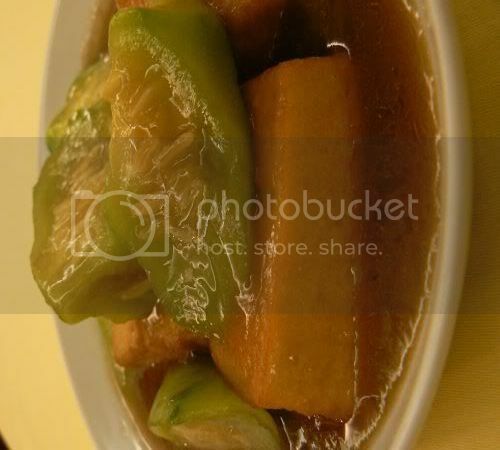 This picture shows another popular dish which everyone orders - the fried bean curd and hairy gourd. The restaurant will make their own bean curd from freshly squeezed soya bean milk which is then deep fried and braised in sauce. I love this dish hence it's always my standard order but nowadays I find the hairy gourd they serve it with is always so old hence we ordered the fried lotus roots the other day. MGIF kicks off next week for the month of November and it's an good time to sample Malaysia's fine dining scene with their special menus. It's been renamed from it's original moniker of Kuala Lumpur International Goumet Festival to include other places within Malaysia. 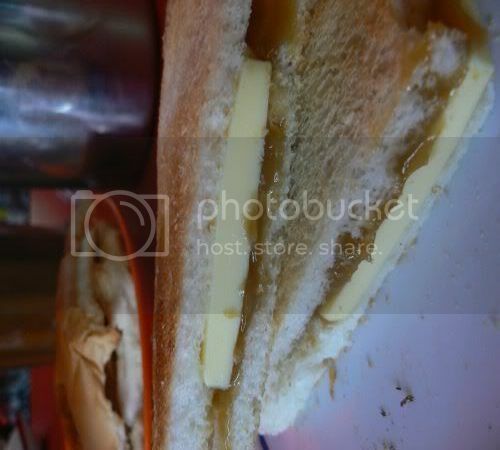 Do check out the different restaurant's offerings on their website. I'm so tempted to splurge on one of them i.e. the Senses menu but I suspect other financial commitments will pull me away from sinking so much monies on one meal. If anyone of you get a chance to taste the menus, do drop me a line as I'll love to hear if the food was worth it. Last night, we all went "crabby" to celebrate my friend's birthday. Excellent choice which came highly recommended by my friend, MY who is the crab specialist. She ordered all the dishes hence I'm totally clueless about what they are all and their prices. It was a big affair as my friend's parents also came along to celebrate their daughter's birthday plus MY brought her two adorable kids. We ordered two crab varieties - Thai barbeque and salted egg yolk. The barbeque variety got everyone's thumbs up as the crabmeat was sweet and fresh tasting. You don't really need the Thai sauce to complement it as it's perfect on it's own. 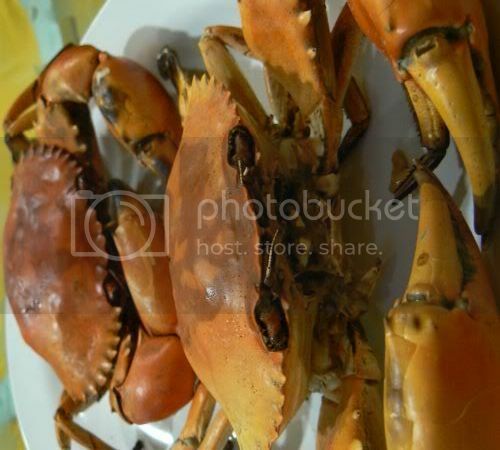 Malaysians love crabs cooked in different styles whether it's sweet black tasting Marmite, spicy and fragrant Kum Heong or with lots of Sweet and Sour sauce. 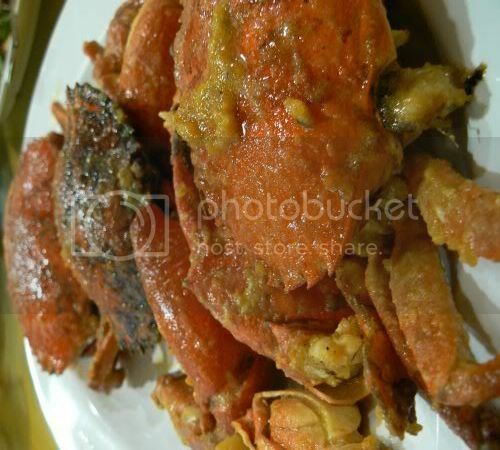 This variety of crabs that is fried with salted egg yolk was pretty good too. I liked how the salted egg yolks coated the crabs. However the taste doesn't really get absorbed into the crab meat as it's only on the outside part. 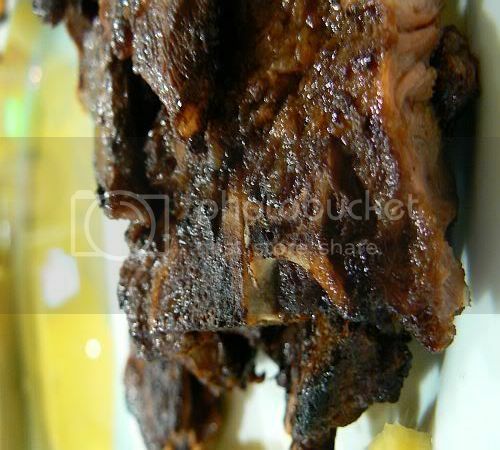 My friend also ordered grilled lamb shoulder which was tender. Since there was no mint sauce, I used the Thai sauce with green chillies and it was a great combination. For the small and big kids in all of us, we had fried chicken with crispy skin and meatballs. This was served with a small portion of sliced century eggs and ginger. 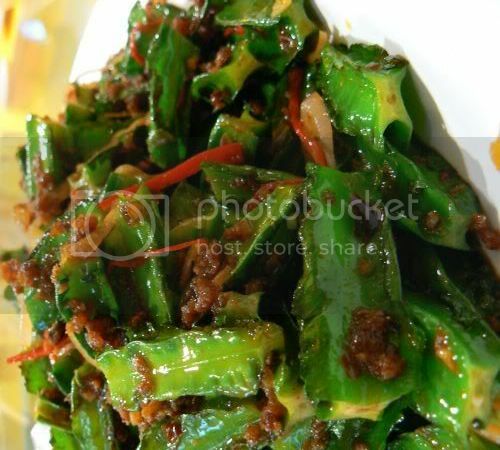 We had two vegetable dishes - this yummy sambal fried four angle beans and tender baby french beans. Didn't manage to snap the french beans as my hands were all full of crab shells. Even after our meal of crabs were finished off with a plate of refreshing and healthy fruit, we were already planning our next crab meal. The damage for the night was RM256 for 9 of us including two kids. Not sure if this is expensive but we thoroughly enjoyed ourselves. By the way, if you love hairy crabs, tis' the season now. 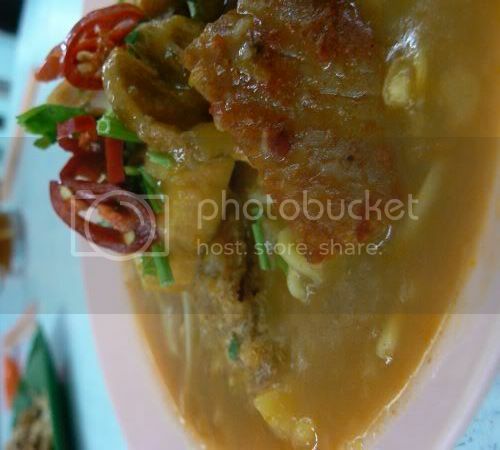 The restaurant serves them at RM38 per kg. Selamat Hari Raya Adilfitri to all! Do celebrate with lots of yummy ketupat, lemang, peanut sauce, rendang and cookies. I know everyone was celebrating last night with fireworks as the cats were terrified. 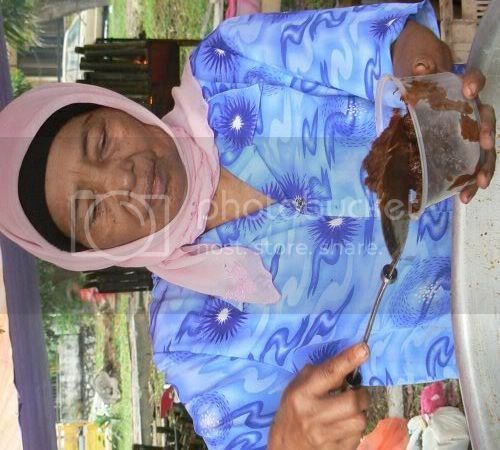 Yesterday, the lemang stalls along Taman Tun Dr Ismail and Damansara Utama started business. 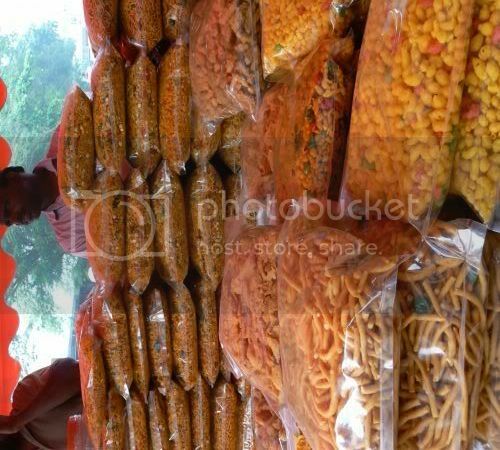 This is a yearly tradition whereby these stall owners travel down from their villages to set up business at the side of the road. A quick count indicates a total of twenty plus stalls last evening including a flower stall. Usually, they camp out here for a few days just before the festivities start since people tend to buy lemang and rendang to celebrate Raya. Things seem to be pretty quiet this time round, probably because the authorities have been sniffing around the area earlier on. The scenes here are similar to last year whereby tents are set up at the back as they will camp out at this area for a few days. This year round, we decided to be extremely festive and bought one small tube of lemang, beef rendang and bergedel for last night's dinner. 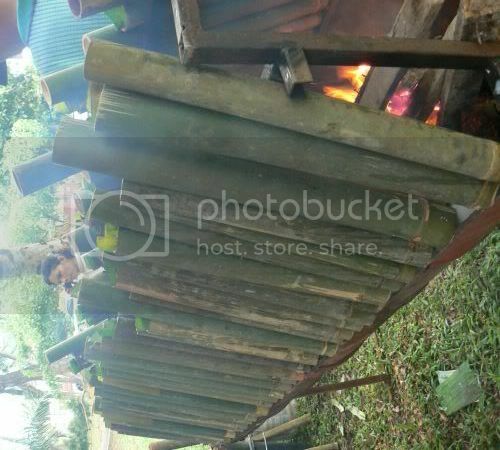 Must admit, it was the nicest lemang I have ever tasted as the glutinous rice was not too hard nor soft. Splashie Boy has a theory that you need to buy a smaller bamboo tube versus the longer ones as they cook better. 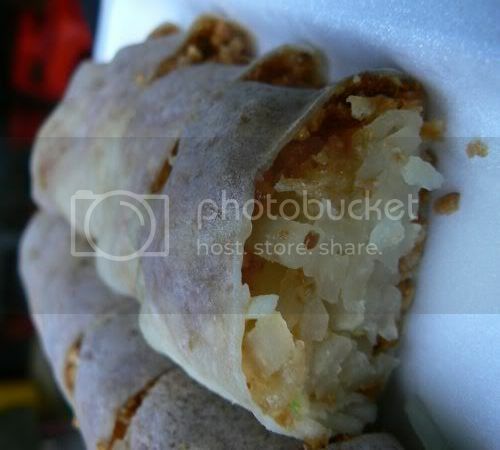 The bergedel which is similar to a potato cake but filled with minced meat was pretty good too. However prices here are at a premium but I rather buy my lemang here rather than drive all the way to Ulu Kelang. If you are planning to drop by here to buy your supply of lemang and rendang, try not to block the road and park at the back. It's just a short walk to the stalls. A belated Deepavali and early Hari Raya greeting to everyone since Blogger was down during the weekend. It messed things up for my Weekend Cat Blogging hence no posting for that. I won't be posting during this festive season but depending on if I can find those lemang stalls (yesterday, we drove past Taman Tun Dr Ismail and the authorities had parked their enforcement vehicles there), I will add some Raya posts. The city does seem to be quieter especially the roads. However the malls are still jam packed with people doing their last minute shopping. Have fun and remember to eat lots of muruku and rendang this season. Recently, I had an opportunity to try out the vegetarian fare served at this food centre located just off Tengkat Tung Shin. Babe in the City - KL has been talking about this place a few times which got me curious. It's quite easy to find with her instructions and it's basically a food court serving all kinds of stall food with vegetarian ingredients. There is also a small shop selling frozen vegetarian items and cooking ingredients if you wish to recreate the dishes at home. I must admit I absolutely love their char kuey teow here - it's fried to perfection, not too oily and fragrant with lots of eggs in it. Although it does not have many ingredients in it except bean sprouts and vegetarian fish cake, it's an extremely satisfying meal. 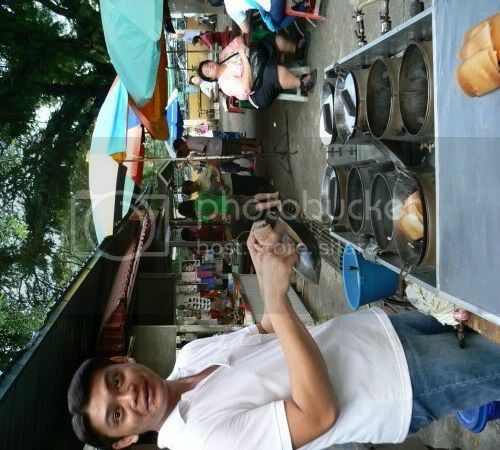 What is also amazing is the man who fries it is an Indian fella called Ah Wah who speaks perfect Cantonese Chinese. He's perfected his technique of frying it as he has been doing this for the past twenty years. 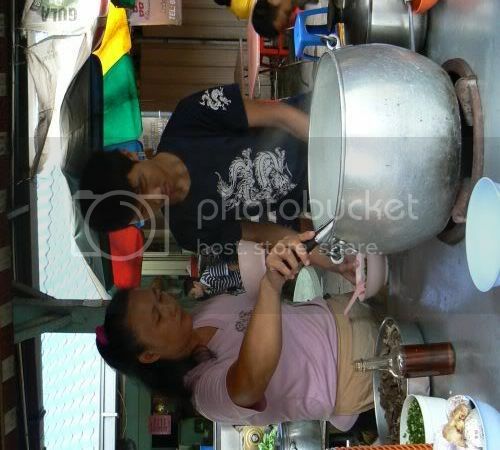 Every hawker food is represented here including Assam Laksa. This wasn't too fantastic as the assam sauce wasn't tangy enough versus Yue Yee Chai's version. 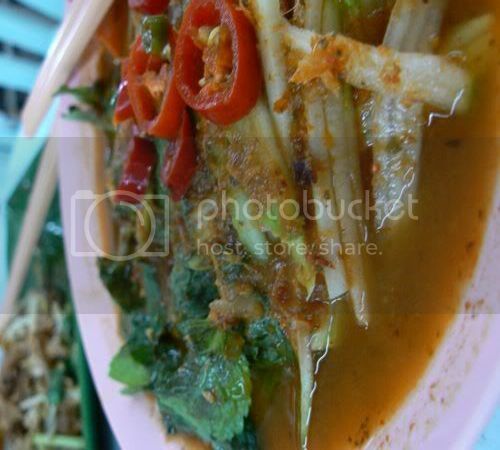 We also had their Mee Jawa which came in a thick broth that is thick with sweet potatoes. Big mistake trying this out as this was horrible hence this is definitely off the list of items to try again at this place. The only thing I notice about this food centre is majority of the people working at these stalls are Indonesians instead of locals. 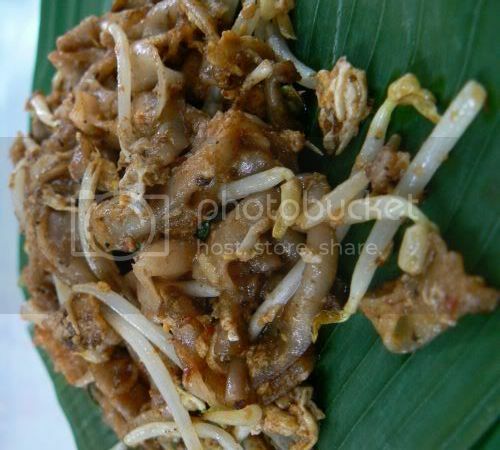 Only the Char Kuey Teow stall has some form of continuity since the man has been frying his kuey teow for twenty years. Yesterday, we indulged in some wicked Chocolate Steam Pudding with Vanilla Ice Cream (RM10++) to celebrate good news we received. This is currently my favourite indulgence as the steam pudding is not too rich but still chocolately enough to make it feel sinful. They have a wide selection of cakes and desserts here so do take your pick from: apple pie, banana cake, banoffee pie, black and white chocolate, blueberry cheesecake, bread and butter pudding, carrot cake, cheese cake, chocolate banana mascarpone, chocolate berries meringue, chocolate bittersweet, chocolate brownies, chocolate cinnamon, chocolate moist, chocolate mousse, chocolate silk, chocolate walnut, italian cream cake, mango cream pie, mixed fruit meringue, orange and almond, pavlova, peach and banana crumbe, pear and ginger upside down pudding, pecan pie, tiramisu, zucotto dome and etc. Note that not all desserts are served at one time hence it's always advisable to call them ahead to check what selections they have available for the day. Besides desserts, the main meals are great too especially the Sarawak Laksa, Mee Siam, Chicken Rice and pastas which are old favourites whenever we visit the bistro. 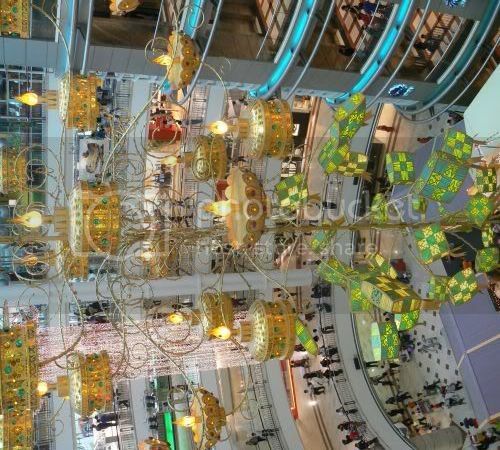 Last weekend, I finally managed to sneak into the mall to do some shopping and I was amazed at this year's Deepavali and Raya decorations at Suria KLCC. 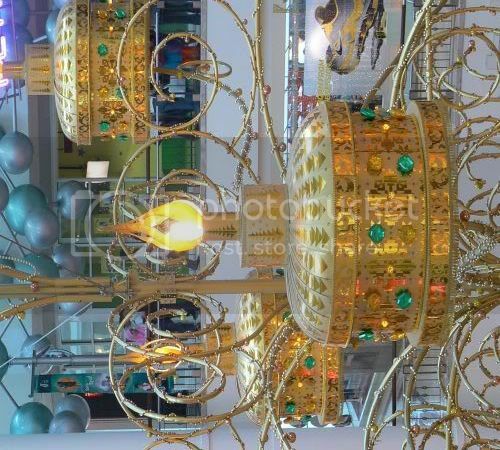 To celebrate the joint occasion, they had combined the Deepavali jeweled oil lights with ketupat lights which hung from the middle of the mall. At the foyer, they have recreated a Malay and Indian street with ketupat weaving, Malay and Indian cookie making, jasmine flower garland making and etc. There are also musical performances on traditional Malay instruments like the keroncong and angklung plus Indian classical music to get everyone in the festive mood. I didn't take any pictures of the stalls because most of the people manning them were taking a break when we walked past. 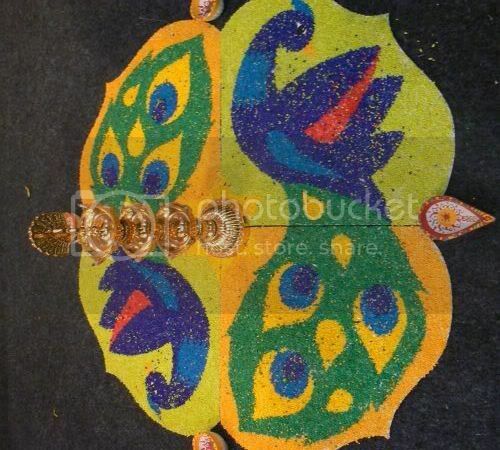 I did manage to snap a picture of the kolam/rangoli they made from coloured rice grains. 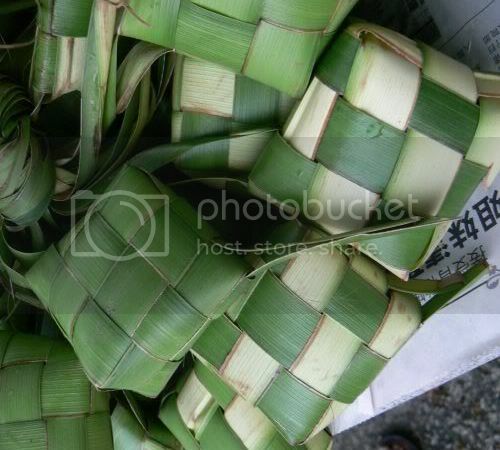 This is essential for Deepavali and it's usually found in foyers of shopping complexes and office buildings. You can actually recreate this at home as they sell these kits with the coloured rice at shops in Brickfields. They all have different patterns and this one features two peacocks. Braving the hazy skies, I made my annual walkabout around Brickfields. Like last year, huge tents have been placed at the empty area between KL Sentral train station and Jalan Tun Sambanthan. If you're travelling from KL Sentral to the KL Monorail, there is no way you can miss these stalls, since you need to pass by them to switch stations. This year, there are four sweet stalls around hence I get to focus on the food rather than the decorations. This particular stall has prime location since it's the first stall you see when you walk over from the KL Sentral train station. It also has a lot more savoury items which they were preparing on site. 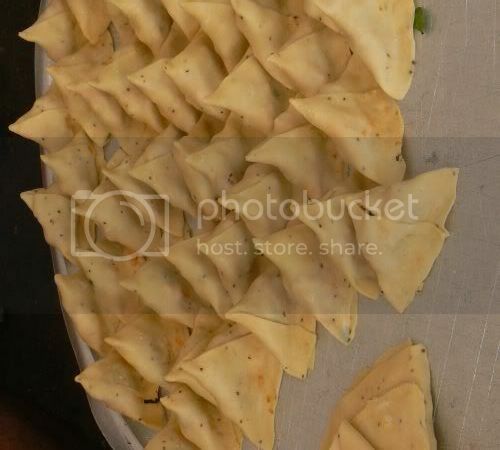 I managed to capture pictures of this man making samosas at the back of the stall - folding the skins, inserting the curried potato filling before shaping it to triangular shapes. Another popular item which the stalls were selling were these savoury snacks that were deep fried on the spot. Deepavali won't be the same without Muruku and all those crunchy stuff when you're catching up with old friends. 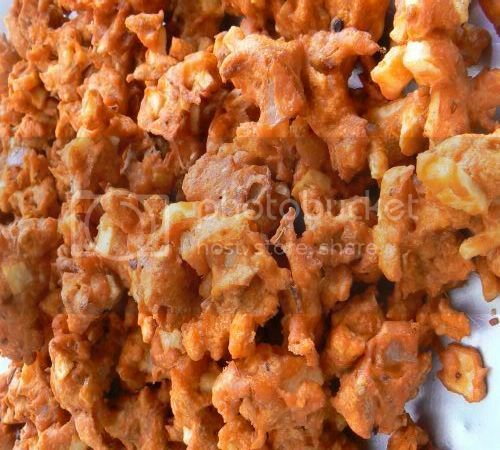 In fact, we have two big bagfuls of Muruku for the festive season at home too. 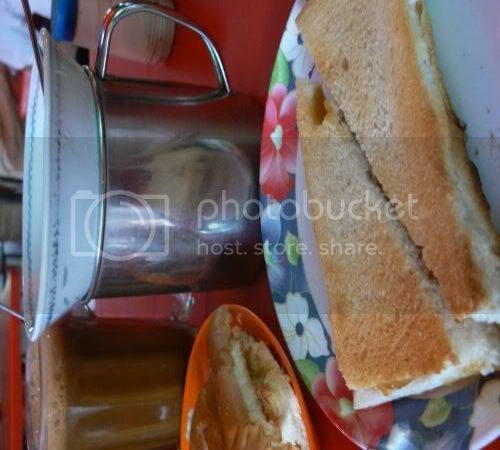 This particular stall is located at Jalan Tun Sambanthan. 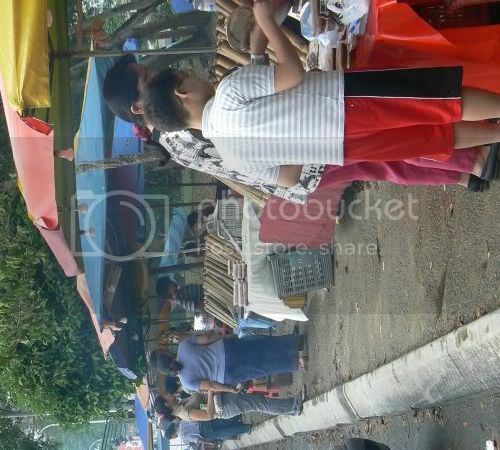 Since there are a few muruku stalls, do remember to shop around. I like how some stalls will make their sweets at their premises. This gives a chance for the tourists and people like me to see the whole process and it confirms also how fresh the sweets are. 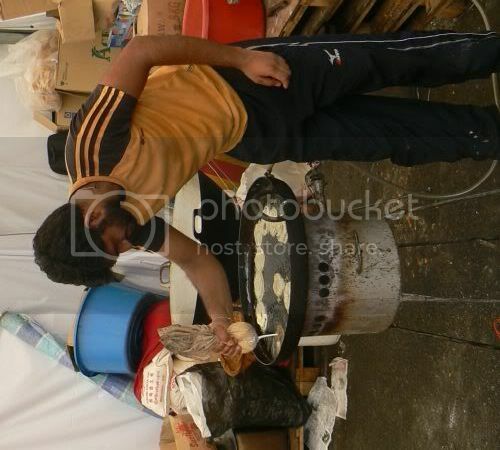 These two fellas at the Moga Punjab Caterers stall were making the sweet jalebi. 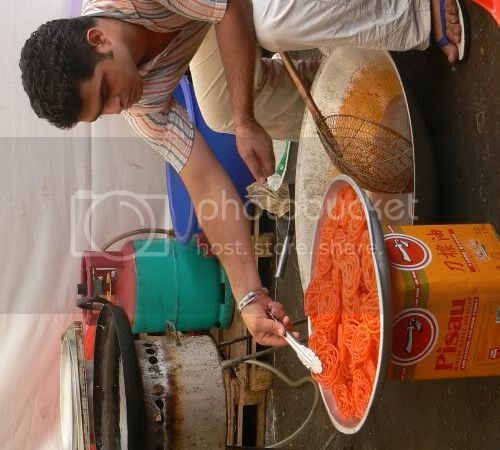 First, he will pipe the batter that is made from a mixture of plain flour, gram flour and water in swirls into the hot ghee. Once the fritter is crispy, it is then taken out from the hot oil and drained. Subsequently, the deep fried fritter is then dipped in the tangerine orange coloured syrup. It's slowly drained and stacked up on a metal platter all ready for customers to pack back some for the festivities. 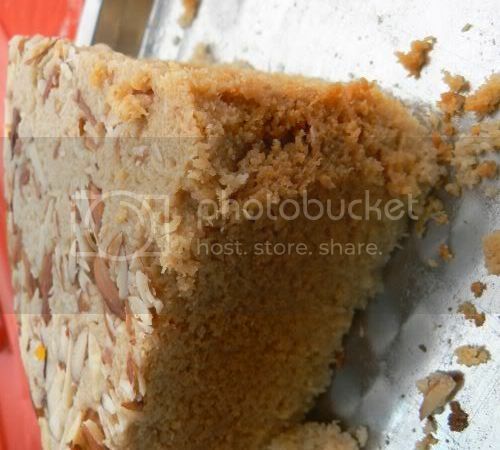 This seems to be this year's favourite as I saw so many stalls selling this Milk Cake which is made from full fat buffalo milk, brown sugar, and topped with flaked almonds. I bought some to try out - 100grams for RM5 and it was deliciously rich and flaky. This is the ever popular Gulab Jamun which is deep fried balls of khoya (reduced milk) that is soaked in a sweet syrup. 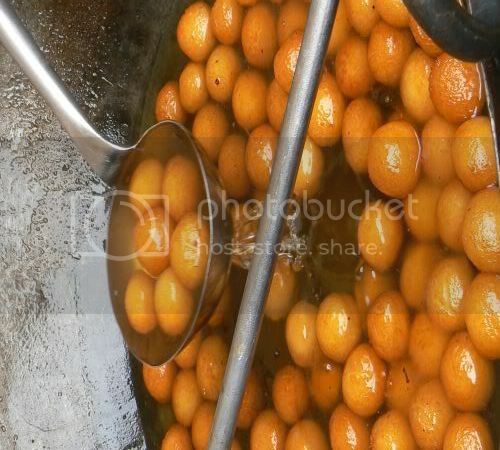 This stall was preparing the Gulab Jamun in a wok and scooping it slowly in a container to be sold at their stall. Something new this year, this sweet called Cham Cham (I think! as the stall owner's accent was quite strong). It has a stuffing of cream cheese and an almond on top of it. They come in various rainbow colours - barbie doll pink, sunshine yellow, apple green and rich brown. It's also extremely rich as the outside is soaked in syrup. Very sinful but yummy if taken in small portions. 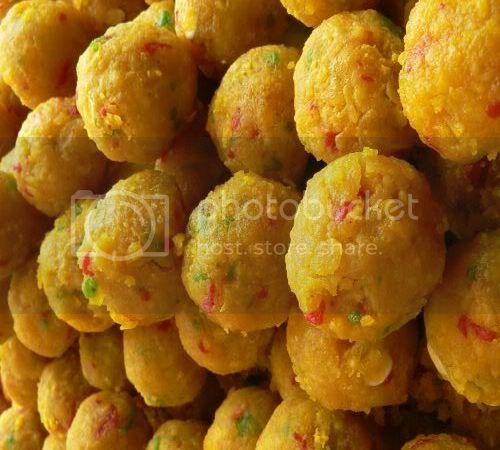 Sweets like these laddus made from gram flour and spices are a must have during the Deepavali occasion as it's believed if you serve sweet things during the festivities, this symbolises a sweet and happy year ahead for you. 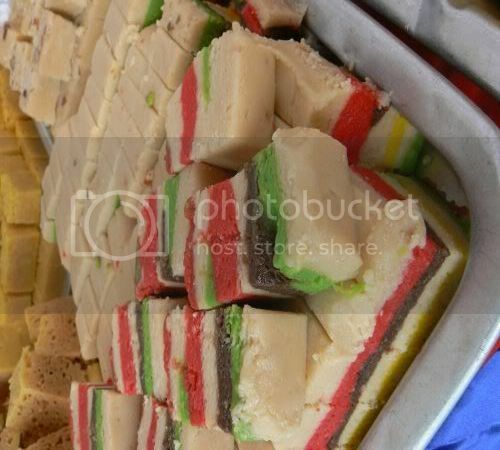 Like fashion, there are new sweets every year and this time round, I thought these multicoloured palgovas at the Punjabi Sweets and Restaurant stall look really pretty. 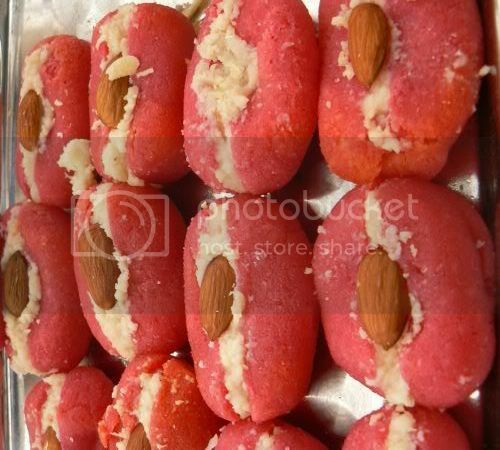 People were going around trying out sweets and buying them like these almond studded palgovas. 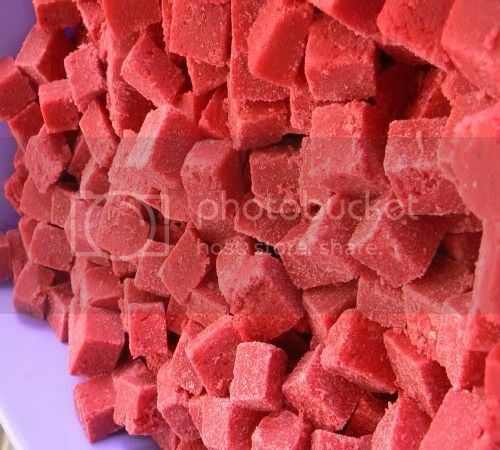 Besides the sweets made from buffalo milk, you can also get bright pink and green coconut candy which is made from evaporated milk, condensed milk and grated coconut. Sometimes different flavours are added to the coconut candy like chocolate. 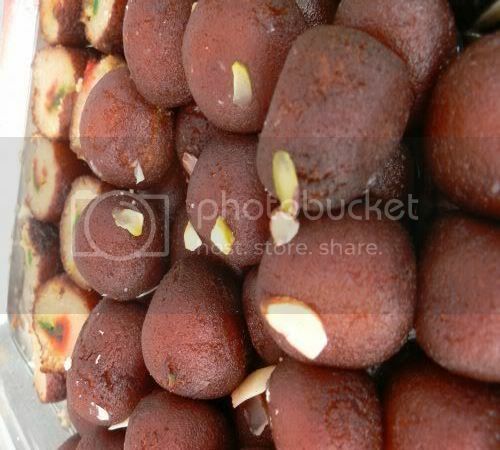 One of my favourites, black Gulab Jamun with a coloured filling. I'm not too sure how they make it until it's black in colour but I find them not as sweet compared to Gulab Jamun. 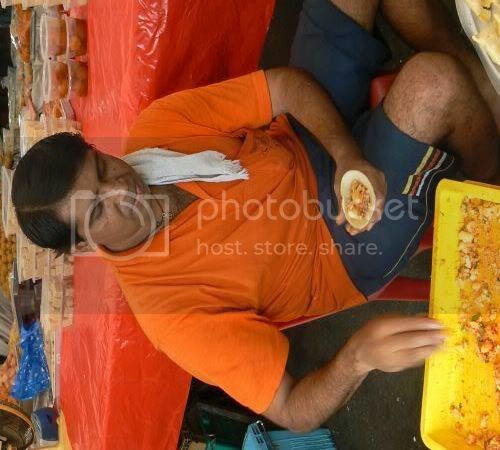 Hope you enjoy this year's Brickfields coverage and for more Indian sweets and decorations, do check out last year's posts on Klang's Little India and Brickfields bazaar. 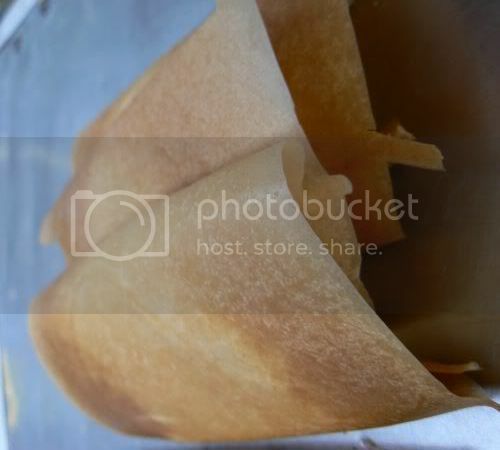 I have also added the post I also did on sweets I found at Lotus Restaurant along Jalan Gasing which has detailed pictures and names of the various sweets. At the area between KL Sentral and Jalan Tun Sambanthan. More stalls available along Jalan Tun Sambanthan which sell various garlands, decorative items and clothes for the festive occasion. Dim sum is food I eat once in a blue moon. Not too sure why but sometimes it's difficult to get really nice ones hence I don't eat it often as I like. I do have childhood memories of indulging in Sunday dim sum lunches at the old Merlin Hotel's Chinese restaurant where Concorde Hotel is now. My favourites were the steamed char siu paus and their cool coconut dessert. What was also memorable was their tortoise pond which was an essential spot to play at. Recently, we visited Teochew Restaurant, an old style Chinese restaurant which still serves their dim sum in metal pushcarts just like the old days. I love that way of serving dim sum versus the order from the paper menu which is adopted by most restaurants since I'm hopeless in Chinese and visuals of my food is a great guide. Char siu pau is an essential for me but this time round, I settled for these mini chan buns which also contain the same meat filling but they are encased in a bread dough. 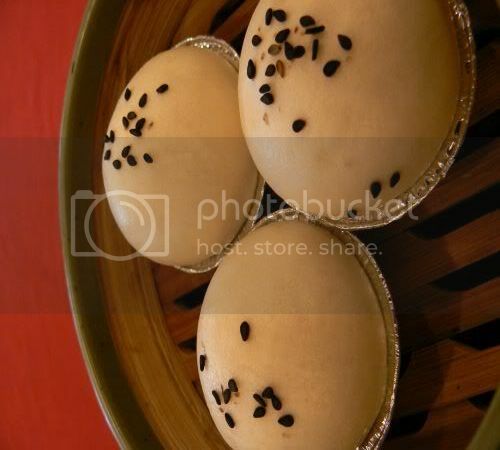 Something unusual in dim sum restaurants, steamed pumpkin buns topped with black sesame seeds. 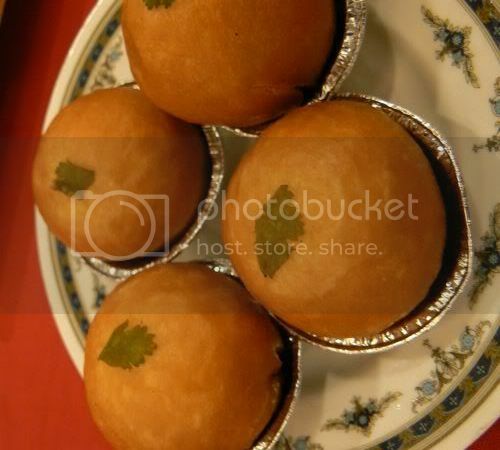 This was really yummy and nice, I love the sweet pumpkin filling encased in the steamed bun. Not many people eat dim sum nowadays as they claim it's too rich and the meats they used are too fat. 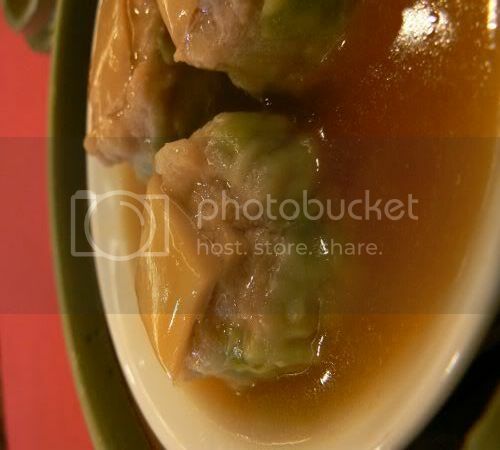 It's okay to indulge in them once in a while just like this abalone topped dumpling. For me, I usually drink lots and lots of chinese tea during and after the meal as it's believed that it helps disperse the oil within your body. 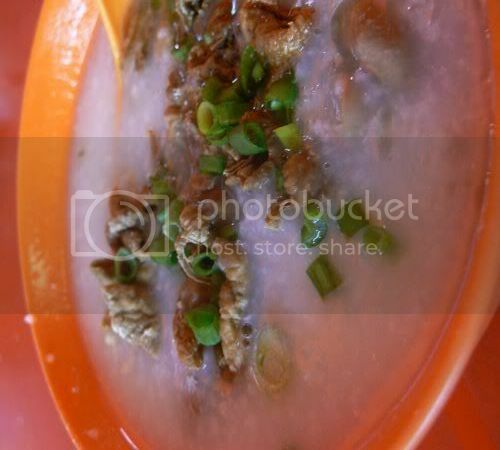 Teochew Restaurant has a slightly different version of the glutinous rice, it's fried instead of steamed. Not so great as it was oily and somehow the flavours weren't so nice. 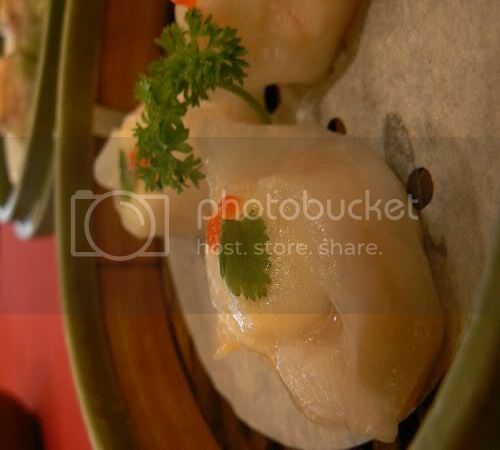 An essential order whenever you eat dim sum is the Har Kau - steamed prawns encased in a semi transparent skin. The prawns were crunchy and the skin was not too thick. 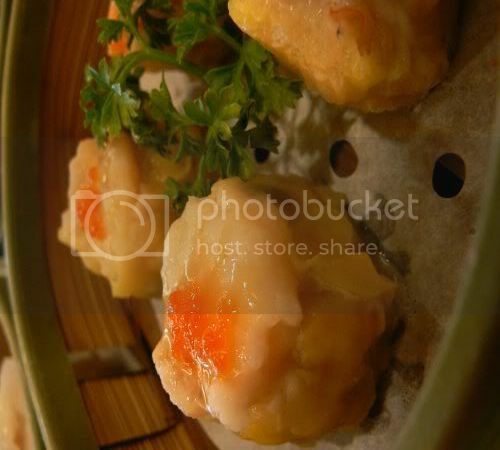 This is similar to the Har Kau except fresh scallop topped with fish roe is used instead of prawns. 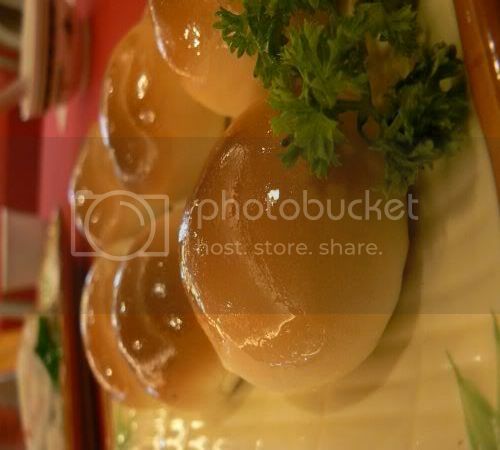 Another must have in dim sum restaurants - siu mai which is steamed dumplings encased in a thin wrapper with a meat and shrimp filling. This is topped with crab roe. Certain of their dishes have been given modern twists like this chee cheong fun which was stuffed with pumpkin, mushrooms and sweet corn instead of the usual char siu and prawns. Pretty good stuff I thought. For desserts, instead of the egg tarts, we went for the deep fried buns filled with salted egg yolk custard that were yummy and rich tasting. If you want to indulge in some old style and slightly modern dim sum, do try this place which has almost 100 types of dim sum they serve for breakfast to lunchtime (7.30 am to 2.45 pm). 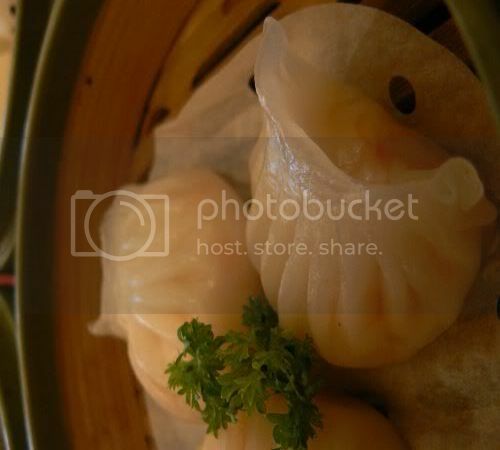 They also have a limited dim sum menu at night with less fried items. Besides dim sum, this restaurant also serves Teochew specialities like Teochew Special Fish Noodle, Teochew Salted Duck, yam and vegetables in claypot and Teochew style steamboat with fish head.